Let's call the Hokkaido-Inu the Ainu Dog ! Height and length of body are in the ratio of 10:11. Regarding the length of body, female is longer than male. Coat: medium short, thick, and double. There are so few black, gray, sesame, or brindle dogs (especially brindle dogs). Eyes: somewhat small, dark brown, and set triangularly. Chest: wide and deep. Tail: large, full, and carried over back or against flank. Tail: large, full, and carried over back or against flank. 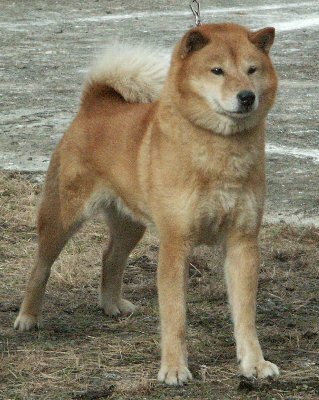 Names: Ainu Dog, Hokkaido-Inu, Hokkaido-Ken, or Ainu-Ken. In 1937, the Ainu dog was designated in Japan as "a rare speciesprotected by law" and it was decided that the official name of the breed would be Hokkaido-Inu. 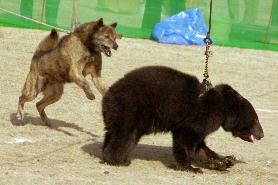 However, the dogs are almost always called Hokkaido-Ken among the Japanese people. In the Japanese language, both "Inu" and "Ken" mean dog, but "Ken" is usually used with a noun such as the local name (for example, Hokkaido-Ken, Kai-Ken, and Shikoku-Ken). In fact, the use of “Inu” with a noun is generally considered incorrect. Thus, while the formal name in Japan is Hokkaido-Inu, the expression Hokkaido-Ken is more generally used in the spoken language.